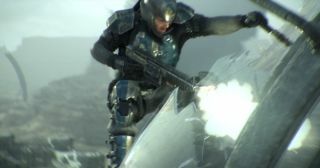 Sony Online Entertainment debuted the complete PlanetSide 2 CGI trailer today at the ChinaJoy International Digital Entertainment Expo. Wow, what a spectacle. It's obviously not at all representative of what it's like to play the game (unfortunately, I'm pretty sure you can't run on top of a dropship while shooting passengers through the hull), but it is an impressive vision of the game's aspirations, if a bit further on the gritty, desaturated side of the planet than we expected. Have a read of our most recent preview for an idea of what playing PlanetSide 2 feels like, and look for lots more coverage as it enters beta.